Swansea City midfielder Ki Sung-yueng says he could have joined Sunderland last summer but stayed with the Swans because they are the "better team". Ki, 26, spent last season on loan at the Stadium of Light but was convinced to return by Swans boss Garry Monk. 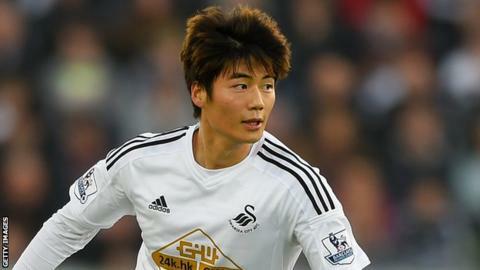 The South Korean scored Swansea's goal in Saturday's 1-1 draw with Sunderland, and is pleased he stayed. "I had the choice, Swansea or Sunderland, but I think Swansea is the better team," said Ki. "Swansea play better football, Swansea have better players to be fair - that's why we are higher up the table. "I'm really happy to be in the squad, to play for Swansea. This is a great time to be playing with these guys." Ki joined Swansea from Celtic for £5.5m in 2012 and he made 38 appearances in all competitions during his first season at Liberty Stadium. But under then-manager Michael Laudrup he was loaned to Sunderland for the 2013-14 campaign. Ki impressed at the Stadium of Light, scoring four goals and helping Sunderland reach the League Cup final. The Black Cats were eager to sign Ki permanently and, although he enjoyed his time on Wearside, a conversation with Monk last summer convinced South Korea's captain to return to south Wales. "[Sunderland manager] Gus Poyet made me grow up a little bit more and, this season, Garry Monk gave me a fair chance in the team and then my confidence has grown," said Ki. "Even though Garry spoke to me and I was in his plans, I had to show that on the pitch. "I have to show Garry that I'm capable of playing for Swansea, so I have to work hard. That's why I'm settled with the players and Garry." Ki's goal against Sunderland on Saturday capped a fine performance on his return from international duty with South Korea at the Asian Cup. The former FC Seoul player captained his country to the final, where they lost to Australia after extra time. "I didn't know I had become captain, so it was a bit of a surprise," he added. "There was a lot of pressure on the captain which I didn't realise because I'd never been captain, so it was a great time. "We were in the final but couldn't be champions, but it was a great experience."